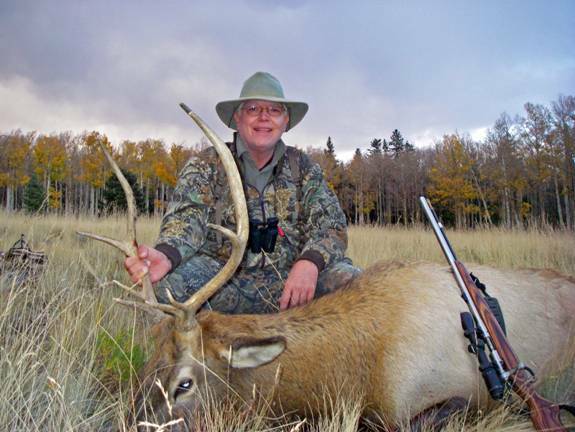 I want to thank you for your expertise and recommendations regarding setting up my Savage muzzleloader for my just completed New Mexico elk hunt. This was our groups first experience with muzzleloaders and your information shortened the learning curve. I cant believe how many fellow muzzleloaders we encountered at the range and in the field that had never heard of Blackhorn 209 powder. BH209 is every bit as good as claimed, and we experienced no problems with ignition while hunting at 10,000 feet. I bought a Savage, two others bought T/C Bone Collectors, and one hunt group member bought a T/C Impact. After 4 range sessions all members found 110 volumetric grains of 209 to be a very accurate charge. My Savage liked a 290 gr. Barnes Spitfire T-EZ with a Black MMP HPH 12 sabot, one of the Bone Collectors like the same bullet with the supplied blue sabot, the other Bone Collector preferred a Scorpion PT Gold bullet & Harvester black crush rib sabot, and the T/C Impact loved the 290 gr. Barnes Spitfire T-EZ with blue sabot. We had no problem keeping all of the shots out to 200 yards from these guns in the kill zone on a Caldwell real deer target. This young bull responded to a cow call and came straight at me out of the Aspens. I kept waiting for him to turn sideways a bit, but he kept coming. At 75 yards he stopped and began to wonder what hed gotten himself into to. I let him have it, and he dropped like a stone. I aimed for a low, frontal right chest shot and the bullet never exited. We quartered the elk and removed the backstraps and tenderloins without eviscerating, (very clean and quick). My guide returned to the kill site 3 days later and said the carcass was picked clean by ravens and coyotes. He could see that the bullet obliterated a large portion of the first rib next to the sternum, and he surmised that it did a number on the top of the heart and lungs. Free range, truly organic elk steaks, sausage and jerky are in the freezer. Thank you Mr. Elk! This 290 gr. Barnes Spitfire T-EZ was recovered from my hunting buddy (Craig Redmanns) 5X5 bull. He knocked the bull flat with a 145 yard broadside shot. 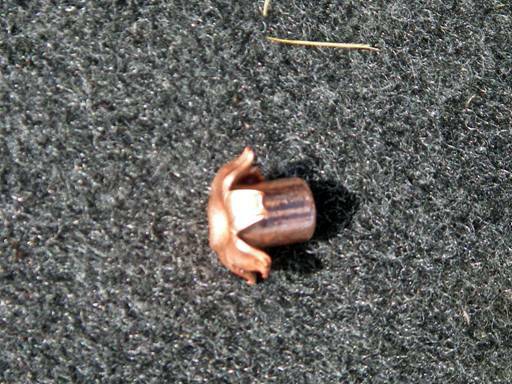 The bullet broke the entry shoulder and was recovered under the skin on the opposite shoulder. Again, we quartered without eviscerating, but from the blood evidence we could tell that it took out at least one lung as well. What a great bullet for inline muzzleloaders! I have no idea what the muzzle velocity is for 110 gr. of BH209 and the 290 gr. Barnes Spitfire T-EZ, but its more than enough to kill a bull elk. Congratulations to Allen and his friends, now that's the way to really start enjoying big game muzzleloading! One hundred ten grains, by volumetric black powder powder measure, pushes an all-copper Barnes T-EZ 290 grain in the general vicinity of 1975 fps. There is no game animal I can think of in North America that this bullet won't handle, from "groundhog to grizzly" as they say. It has done a superb job on large, old, extremely fat black bear as well... my Dad and I can tell you that. I've got only one question for Allen. When's the next hunt? Again, congratulations to Allen and Craig Redmann for a job well done.